While I was in New York, I often turned up to parties in jeans and Converse. At first, I would feel out of place but then people would tell me “You look sooo French! I wish I was French.” I didn’t know what they were talking about; I was wearing neither a beret nor onions after all. Whatever it was, it seemed to be desirable. I realised that the French had a special look and attitude when I came back to France and then again when I moved to Switzerland. Bed-head. Light make-up. Simple and comfortable, yet classy outfit. Nonchalant attitude. Smile. Looks like she’s thinking about something else. Just got out of bed hairstyle, 3 day beard, messy collar, nonchalance, smile, sparkly eyes. The French mastery of the bed-head hairstyle doesn’t mean we never shower! Negligé isn’t dirty. Your hair and clothes need to be clean but it’ll look Frencher if you mess it all up a little before going out. French women sure use brushes, straighteners and irons. How many times did I straighten my hair and then mess it up a bit to avoid looking over done? Same with guys. They prefer to have a little beard showing that they don’t care rather than being freshly shaved. Their shirt will never be perfectly ironed. The French will manage to add a bit of negligé to their look, even in a suit. Since the French hate looking overdressed, they tame their style by mixing cheap basics with more charismatic pieces. Even if it means showing up underdressed at a party, it won’t matter- it’ll look cooler. Insouciance means having no worries. To achieve this attitude, you have to act like you don’t care. The French are friendly with an easy smile but they tend to stay in their own mysterious world, thus keeping a distance. Unfortunately, some people misinterpret insouciance with rudeness or disdain. I’m always surprised when I hear that someone thought I was snooty when I really tried to be friendly. I guess you have to give up being liked by everyone in order to look French. – Stripes: it’s a bit cliché but whenever I go to France, I notice that everyone wears more white shirts with colourful stripes than anywhere else. – Never ever wear sneakers, especially white ones. Except to do sports, obviously. In France, we can spot tourists with their white sneakers. If you want to be comfy and look French at the same time, wear Converse or ballerinas for girls instead. Did I forget anything? How would you describe the French look? I think I could like the French styles. Ah Cecile! I love this little post! I have been told that I look like a French woman before, and I took it as quite a compliment. I hope New Zealand is treating you well so far! I bought my first scarf when I was 18 in Paris at a Naf Naf. I still have it alongside the many I’ve since collected. With my naturally wavy hair it always looks tousled it’s something I’ve tried to tame, and much like myself, it’s just not possible so I live with it :) I believe if my motorcycle boots aren’t welcome…my interest wanes at the party invite. Fun post! Naf Naf is a cool shop! There aren’t any of those in the US, right? Your curls look very pretty in your profile photo, is you hair naturally that way? Hi Cecile. Never mind how I found you; I don’t remember either but no regrets getting into the vastness of your thoughts as in this post which is a bit hilarious but mostly interesting. Your effortless English doesn’t make it look like your second language. It has been my most difficult second language but I’m learning it fast and forever learning it. And seriously, I wonder if you could write about the more popular French kiss too. Since then romance was never the same again.Thank you for this very interesting and thought provoking post. Thank you so much for your kind words, Maxim. I just checked your blog and your English seems pretty good to me! I lived in Paris for a year when I was 25 (long time ago) and it forever altered my style. I grew up in Canada and live in NY; I’ve been told a few times my look is more European, like choosing to wear brown, cream or navy blue instead of black whenever possible, lots of scarves. I think a few other French details that are really key are excellent tailoring and fit (my French jackets have a much narrower width in the upper arm and a much higher cut there, a totally different look) and the desire to personalize your look. American women seem to like cookie-cutter safety when the French women whose style I admired would change a shoelace or a belt and make the look their own. I also buy fewer pieces but better quality — very French and very NON American. I like the French woman’s combination of confident nonchalance with a very clear sense of elegance. Hey Caitlin, thanks for sharing your experience here. I could add a whole section to my post with your comment, except for the part about avoiding black- a lot of French women, especially in Paris, wear black all the time. Au compliment le français il n’est pas nécessaire d’insulter des Américains.! I agree! When I stayed with my French friends in France and London, I always strove to capture some of that ‘effortless style’. It’s when I first discovered spray dry shampoo! A little texture to your hair goes a long way and freshly washed and blow-dried hair can make that difficult. Great post! I have a feeling you have to be fundamentally hot too…I’d say I’ve mastered the somewhat scruffy look, but I just look…a tad scruffy. The French are just born with an aura, it’s not fair! What a great post… I think I am spiritually French, while shackled by my English-ness: I hate looking over-dressed, have never worn much make-up, and often get accused of looking aloof (alright, “fed up” is what they actually say, but I prefer aloof). I have just bought some Converse, so I’m getting there. However, I find as I get older, I compensate by wearing more make up and a more ‘done’ hairstyle — I wonder, how do French women cope with aging? Of course French women hate the aging process as much as the others. The ones I know also starting worrying more about their make-up and hair with age… So you’re definitely spiritually French! P.S. AND scarves .. I’ve seen really interesting ones! It’s be interesting to see ‘before’ and ‘after’ photos of your French transformation ;-) I must admit that I simplified the French look a lot for my blog. 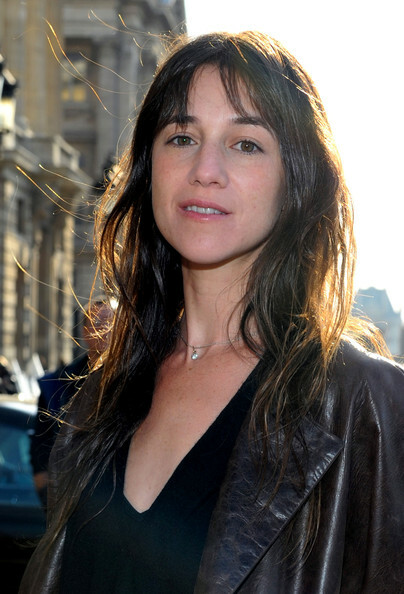 A lot of French women are much more sophisticated than Charlotte Gainsbourg! Especially in Nice where I am from, dyed hair, fake nails and a lot of make up are very popular as well… Maybe it is something from the south? :-) Cool to share stories with fellow expats and that I’m not the only one having weird thoughts on the world! In the book I am reading at the moment one of the characters has a “baisenville en skaï”. I’d say that definetly makes his style very french. I suppose it’s just another example of a high quality accessory. Thanks for stopping by Martin :-) It can’t be a high quality accessory cause skaï means fake leather… What’s this book you’re reading? hahaha your blog is hilarious! You should see my pre pregnancy clothes! They are what got me pregnant in the first place. Also, in the South we do big hair. Lots of hairspray. Oh yeah, and I made up the expression to American it up. I make my own vocabularly quite often. Haha – love this!! I think you have absolutely nailed it! It is definitely something difficult to explain to my American friends who come to visit…I tell them, you don’t need anything fancy even for a nice restaurant. We definitely tend to dress up more in the US – it’s been a shift in my style to try to be “relaxed cool”. hah! Hmmm…yes, maybe I will use that as inspiration for this week’s post!! :) If so, is it okay if I link back to yours? “Never ever wear sneakers, especially the white sneakers.” — I was thinking that I should dump my sneakers. And now I will. Once I get myself a pair of Converse. I would love to hear more about more options. I really dislike sneakers for daily wear (especially since I rarely wear shorts or anything “sporty”) but I’m at a loss for other options. Plain brown/black shoes are classy but get boring after a while. When I think of “stereotypically French girls” they usually have dark hair. Is it a French thing to not bother with highlights or dyeing their hair blonde? Most of all, they use much less product in their hair. Having lived in both countries, I can tell you that the market for hair product is much smaller in France. That’s also what makes it look more natural, I think. Super :-) Mais n’as-tu pas l’impression que la différence est moins marquée en Suisse, ou plus généralement en Europe, par rapport aux Etats-Unis?